NEW DELHI, DECEMBER 3: The management schools of various IITs: Bombay, Delhi, Madras and Roorkee have been consistently scoring well in the NIRF ranking. 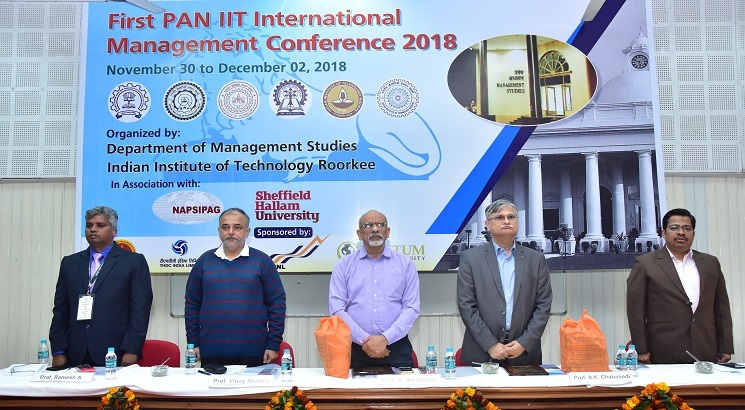 In an attempt to collectively promote and create a Pan-IIT Management School brand, six IITs offering Management education, initiated PAN IIT International Management conference. The first edition of the conference was organized at Department of Management Studies, IIT Roorkee in order to promote competitiveness of Indian industry, institutes having similar focus need to collaborate and get involved in different types of exchange programmes. Addressing the valedictory session of the conference Prof G Raghuram, Director, IIM Bangalore, emphasized on the need for stronger relations among IITs and IIMs. He stressed on working with rigor and relevance. He highlighted the role of technology and management in the development of the nation. The Conference brought together technocrats and management experts on one platform. From the unique position of management schools in technology institutes, the conference sought to bridge the gap between the laboratory and society. The themes of the conference were cross-cutting in nature and focused on building business models for sustainable social impact enterprises. Around 400 + management scholars, faculty members, practitioners participated in the conference. Five best papers presented were awarded during valedictory session. Six plenary talks and three workshops from experts from India and UK were delivered in the conference. During inaugural session of the conference, Prof Sushil from IIT Delhi presented the idea of flexibility in the current scenario. He presented the new perspective of LIFE, i.e. Learning, Intellect, Flexibility and Emotional Maturity. He emphasized need of continuous learning for flexibility. Prof Nigel Garrow from Sheffield Hallam University, UK presented the perspective of entrepreneurship in management education. Prof. A.K. Chaturvedi, Director IIT Roorkee elaborated the concept of cross-functional research. He mentioned that research can be done to enrich the body of knowledge of a particular domain. And research can also be done which can be understood by the experts of other fields. He suggested some important problem areas for the researchers for cross-functional research. He expressed satisfaction on the grand success of the first PAN IIT conference. The organizing secretary of the conference Prof Rajat Agrawal elaborated the topics which were identified as latest streams of research and industrial concern where IITs could provide techno-managerial solutions. With an emphasis on Industry 4.0, the conference explored how IITs could provide techno-managerial competitiveness to Indian organizations in this changing era.